You probably must have wished to get a cheap but high-quality road bike, which would satisfy your riding requirements. The Diamondback Overdrive Sport 29er Mountain Bike is here to make your dream come true. It comes with an aluminum hard tail and a 29-inch wheels that will give you the great experience regardless of the type of trail. It is fitted with disc brakes and an adjustable quick-release seat. By this, any user no matters the height can enjoy the wonderful experience of the Diamondback Overdrive Sport 29er Mountain Bike. Look no further than this product for ultimate travel across the world. Great wheels should be your priority regarding requirements when going for a bike in the market. The Diamondback Overdrive Sport 29er Mountain Bike comes in handy with 29-inch wheels, which enable it to overcome obstacles on your way during the ride. This makes traction and speed of the bike just perfect. The riding is eased and made possible in any condition of the road, be it rocky, bumpy or muddy. Quality brakes are also one of the important aspects of a good bike. The Diamondback Overdrive Sport 29er Mountain Bike provides the best braking experience that one looks for in a bike. It is fitted with the best hydraulic disc brakes that will work perfectly in wet and muddy areas without damaging the brake pads and rims. This will relieve you the cost of having to repair the bike regularly. The Diamondback Overdrive Sport 29er Mountain Bike also comes with an excellent suspension that is in the form of an SR Suntour XCR-LO 29 100mm travel Fork. This provides great control and optimal comfort when riding on smooth and rough terrain. It facilitates the maximization of power in situations where the suspension is not required such as climbing on hard-pack surfaces. Avoid the tiresome rides by embracing this comforting bike. It makes your riding experience impressive and motivating to take more rides. This provides smooth shifting options through the reliable 27-gearcombination for steep climbs, instant acceleration or prolonged effort. The pedaling is made comfortable and easy when off-road or any terrain. With this, braking can also be made instant without any fear of accidents. I am sure you do not want to experience a ride whereby you are bothered about your safety. The light and stiff property of Aluminum makes it to be used for making the frames of the Diamondback. This should, therefore, make you go for this bike, as it is easier to carry than any other bike in the market. A lightweight bike speeds up easily, and you do not have to make tiresome pedals for acceleration. The feature makes it the best bike you can go for in the market. Q: Are the Spare Parts Available at my Convenience? A: The spare parts are easily available. The agents are situated at different outlets to cater for your needs. However, you should be careful to look for genuine parts from the authorize agents to maintain the bike’s condition. Q: Does the 21-inch Wheel Mean that it is not fast? A: The product is fast as enhanced by the 27-gear combination, which enables one to adjust the speed. The suspension also facilitates the smooth movement of the bike despite the nature of the track. I would suggest this bike especially to those fond of racing with mountain bikes. Q: Does it come with a Menu on How to assemble at the Comfort of your Home? A: The bike is delivered with everything in good shape, including the menu on how to assemble. However, you might find it difficult to assemble it on your own. In case of this, feel free to contact the agents and you will be assisted at the comfort of your home to avoid any mistakes while assembling. From the above discussions, the Diamondback Overdrive Sport 29er Mountain Bike proves to be the bike everyone should be looking for in the market. 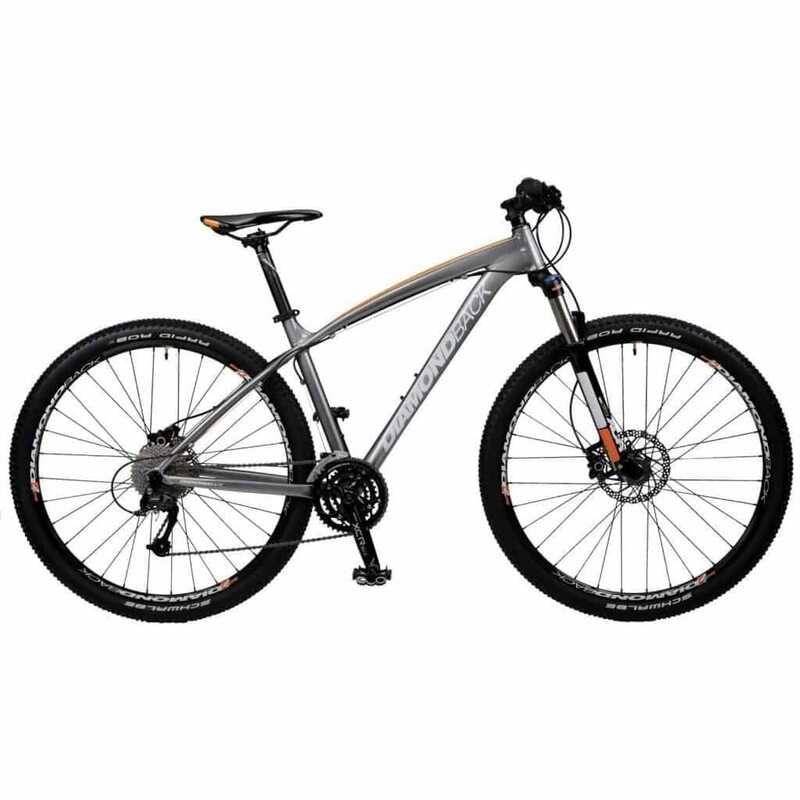 Right from its affordable price, listed in best mountain bike under 1000 dollars, it indicates that it is the bike for everyone despite the financial status. Thus, financial constraints should not be a bother to you. The prize has been lowered for your convenience to enable you to enjoy the experience. The great parts used to make the bike should be the motivating factor for you not to choose any other bike other than this Diamondback right from the 29-inch wheels, which can overcome any obstacles on the way. The SR Suntour XCR-LO, 100mm travel fork suspension offers the comforting experience when riding on any terrain. Shifting is also easier with the help of the Shimano Acera rear derailleur w/SLM-310 9-speed rapid-fire shifter. Hurry and get the product to be in the bracket of those enjoying the great experience. You can make your order online and it will be delivered to your doorstep.